The Laugh and Learn Baby iCan Play Case lets babies enjoy their very own apps while protecting mom or dad's iPhone or itouch. Simply place the Apple device into the case, twist the lock and the electronic is protected from baby's dribbles and drool. The durable, rubber case holds the device behind a clear film to protect the screen. Easy-grasp handles are sized just right for baby to hold. 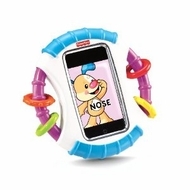 Download free Fisher-Price Laugh and Learn apps from iTunes. Babies love to learn when their interactive touches control the action. And this case is the perfect way to let baby be in control while protecting electronic components. The case entertains baby even without a device inside, thanks to rattle beads on the handles and a mirror on the back. Apple products are not included. It is compatible with the iPhone 1G, 3G/GS, 4G and iPod Touch 2G, 3G and 4G.